This is no tribute reference. The Reverso seen here has survived nearly a century and not lost any of its charm, despite showing some age. Jaeger-Lecoultre re-issued the 1931 Reverso a few years ago. It has become an iconic to the brand. There are many watches you can wear formally, but not many with the effortless grace of a Reverso. 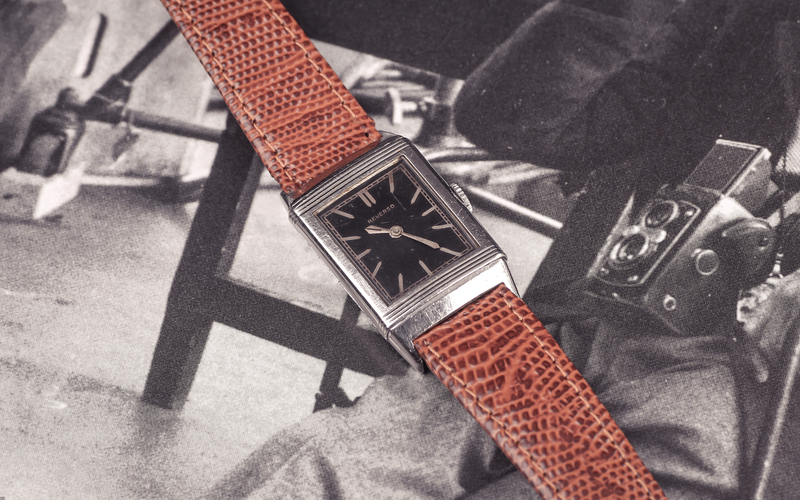 Despite being an icon for sartorial elegance today, the Reverso began with sporting roots. British polo-playing officers of the roaring 1920s were finding wristwatch crystals easily shattered (yes, niche market) while off in other countries. They related to this problem to César de Trey at Lecoultre, who designed what is really one of the first true sport watches. The watch portion was cased in a hinged slide, which could be flipped over to protect the face. The Reverso was a huge success from the start. Something about its purposeful design wound up looking incredibly svelte on the wrist. The design spread from the British aristocracy to a more adaptable, sartorial purpose. This example comes from Russia, at Frezer House of Vintage. It has been clearly worn, but I quite like that. The case and crystal are both aged but not polished. The hand lume appears original, but has flaked. Some early Reversos came with full hand lume plots and others with lume strikes down the center, as seen here. The dial of this one, on the other hand, is in an excellent state of affairs. Other than that, there was no variance until a few years later. First-year Reversos have become increasingly difficult to find for collectors. If you’re after a pristine example, best to hold out. For more adventurous collectors, you wouldn’t have to be too precious about wearing it out. Perhaps even to a spot of polo or for a g&t.